Teach your teen the hymns that you grew up singing! This CD contains 40 classic hymns presented with vocal and instrumental accompaniment in a traditional style. 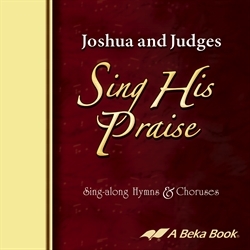 Enjoy hymns like “He Leadeth Me” and “Wonderful Words of Life.” Correlates with the Sing His Praise songbook (sold separately) and the Joshua and Judges Curriculum/Daily Plans (sold separately). Gr. 8.